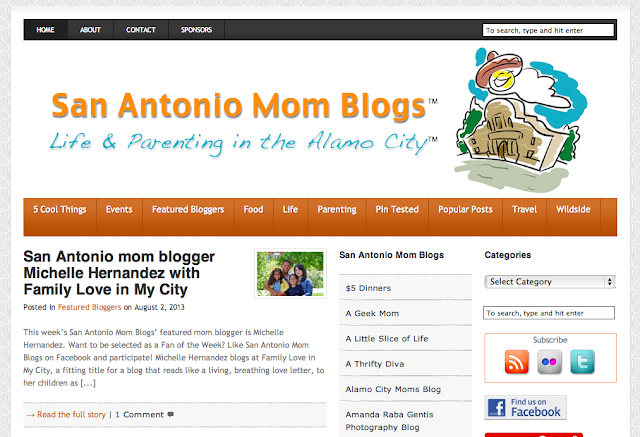 If you are reading this, there's a few things you know about me: I'm a Mom, I blog and I'm from San Antonio. And now that that is taken care of, here's another something I want you to know: I started writing this blog a couple years ago, not knowing of any local blogs. Soon after I created a Twitter account, because it was where bloggers I read were communicating, and low and behold, I found an amazing social media and blogging community in San Antonio. Colleen Pence was probably one of the first people I "met" online and then later in person and it is always a pleasure. Already a marketing and public relations pro, she's a social media mentor and creator of San Antonio Mom Blogs. She just wrote a little feature about me and I couldn't be more thrilled. I have to say that if you like reading my blog, you will also enjoy hers! So stop by the site, say "hi" and connect with San Antonio Mom Blogs of Facebook to get to know Colleen and many other bloggers in San Antonio!